Grand Central Market | Press Coverage | KCET | By Sandi Hemmerlein The idea of the food court has come a long way since we were kids in the &#039;burbs. The idea of the food court has come a long way since we were kids in the 'burbs. Sure, you can still visit your local Westfield shopping mall and walk up to any number of fast food joints, order a quick meal, and take it over to one of their communal tables littered with used napkins and French fry debris, but in the year 2016, the food hall has officially become sophisticated. Now, across Southern California are a growing number of one-stop eating places where you and everyone in your group can each find something to eat and still sit together in one place. And today, your options are far more elevated -- even gourmet -- than ever before. Every city needs a centralized place where its residents and visitors can congregate. 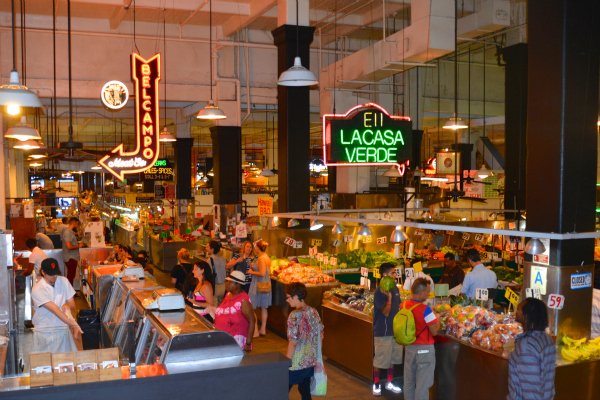 In the absence of a real town square, and considering the fact that people always like to gather around food, Grand Central Market has been providing that since 1917. There's been quite the hubbub over this downtown L.A. food hall over the last couple of years, with many of its long-time vendors losing their stalls to hot new upstarts like Belcampo Meat Co., Wexler's Deli, Berlin Currywurst, Press Brothers Juicery, and Eggslut (and the resulting lines down the street). If you prefer the older flavors of Broadway Historic District, you can still visit Ana Maria's for tacos, China Café, and Roast to Go (since 1952). Or visit Valeria's and buy some dried chilis, spices, beans, moles, and nuts and go home to cook. Grand Central is only open until 6 p.m. during the week and 9 p.m. on weekends, although it will occasionally stay open late in conjunction with special events at the adjacent Million Dollar Theatre. Downtown L.A. is about to have a lot more to offer in the world of food markets than just Grand Central. There's the forthcoming the Bloc (a re-imagining of the shopping on Seventh Street, with Macy's at its center), the arrival of the West Coast edition of Brooklyn's Smorgasburg in the Arts District, and the revitalization that's already started at the historic Broadway-Spring Arcade Building. Already open in the 1925 Spanish Revival-style landmark is BierBeisl Imbiss -- the fast casual version of the once popular and acclaimed (but unfortunately shuttered) traditional Austrian restaurant BierBeisl -- as well as the DTLA outpost of Guisados taco shop. You can also get crepes, fresh pressed juices, and gelato in the skylit, three-story bazaar, which is a kind of glass-roofed alleyway that connects two 12-story buildings between Broadway and Spring Street. Once more of its stalls are filled, the Spring Arcade may move up in the ranks. But for now, it's a good start. The Original Farmer's Market isn't, as its name implies, the original place where you could crawl from stall to stall and get all your fresh produce, meats, and pastries for the week, but it's one of the best. Nowadays, you can also sit down for a slice from Patsy D'Amore's, some tacos from the original ¡Loteria!, corned beef from Magee's, gumbo, French crepes, barbeque, and top it all off with something from Bob's Coffee and Doughnuts. And as you sit there at 3rd and Fairfax, you can bask in the vast history of the intersection where A.F. Gilmore struck oil on his dairy farm in 1900. It's been a place for farmers, grocers, and other merchants to convene and sell their goods since 1934. And visitors have been able to get the best pancakes in LA (or perhaps the world) at Stall #210, Du-Par's Restaurant, since 1938. Don't want to spend all your money on food at Disneyland and California Adventure? Visit Anaheim Packing House first. Located in the Anaheim Packing District, it's a food hall that was built inside a landmark structure preserved from the Orange County citrus industry. While this was once where fruit was cleaned, boxed up, and shipped out, now it's a modern, comfortable, and eclectic destination to sample local culinary treats and support small businesses. There's everything from Mexican to soul food to artisan coffee, crepes, and grilled cheese -- all of which you can eat while sitting on a swing at the bottom level of the atrium. Most of the vendors are open for breakfast, but it's worth a visit later in the day to sip on some wine in a vintage 1920s railroad car at BXCR Wine Bar, which opens at 5 p.m. Check the schedule for live music, free classes, and even yoga in the adjacent "Farmer's Park." Located in Santa Ana's revitalized East End neighborhood is the 4th Street Market, a 30,000 square foot food hall that occupies the space of the former Santa Ana Swap Meet (in an area once known as "Fiesta Marketplace"). Here, merchants can peddle their artisanal wares of all sorts -- from juices and craft cocktails to meats, noodles, s'mores, coffee, and ice pops. It's also unique with its "incubator kitchens," which are commercial kitchen spaces available for rent on an hourly, daily, or monthly basis for entrepreneurial artisans to learn how to grow a business. They won't teach you how to cook or craft, but they can show you how to make money at it. And if you're more of the eating kind rather than the cooking kind, you can also be entertained with a variety of programming including live music, DJs, poetry, and open mic nights. The chef-driven stalls at Fig at 7th show that you can get food on-the-go for reasonable prices without sacrificing flavor or quality. Represented here are a couple of our beloved local chains like Mendocino Farms, City Tavern, Pazzo Gelato, and the predominantly California-based the Melt. And one national food retailer at hall, Sprinkles Cupcakes, at least is really a local business, having started in Beverly Hills. This food hall is probably the closest thing to the mall food court, since you can also shop at a LensCrafters, ZARA, Sport Chalet, and City Target right there, but if you prefer something nice, shiny, and new without the long lines of Grand Central, this place is for you.